Fresh Organic SuperFoods: Sprout Your Own All Winter Long! It seems as though I was happily buying fresh vibrant spinach, lettuce, kale, etc. at Union Square’s local farm stands, blinked, and now it’s Winter. The growing season for the Northeast is over, but for proper daily nutrition we need to rely on produce that’s shipped and flown in from Florida, California, and beyond. Sadly, not quite as fresh, and often over-packaged. I recently found broccoli crowns and mushrooms stuffed into Styrofoam containers, which I brought to the store manager’s attention and refused to buy. Yes, our dollars ultimately will have a voice. Hopefully this chain of stores will display these items as “bulk” purchases in the future. Sprout your own SuperFoods! It’s the biggest nutritional bang-for-the-buck, easy to learn and takes just pennies and a couple of minutes per day. I maintain a constant supply of crunchy lentil sprouts, pea and mung bean sprouts to sprinkle on salads or “hide” in green blended smoothies; chick pea sprouts for home-made “Raw Food” Hummus (You’d never know the difference but its incredibly more nutritious than the traditional cooked version); wild rice or quinoa sprouts for a veggie pilaf and endless other yummy recipes. I even make vegan “sausages” with lentil sprouts and cremini mushrooms to create a meaty texture! Visit www.rawfooddvds.com to see delicious vegan recipes from my DVD, “Green Recipes for Health & Weight Loss”. Why are Sprouts the best source of easily assimilated nutrition? Here’s just one example: Scientific studies have shown exponential increases in the amount of cancer-fighting compounds, vitamin C, calcium, minerals, etc. that are found in broccoli Sprouts rather than the mature broccoli plant stalks that we normally eat. Germination begins when we soak the seeds in water to release their enzyme inhibitors and they “wake up”. As they grow, proteins break down into amino acids, carbohydrates become simple sugars, and fats become essential fatty acids. Good news for those who complain of flatulence after eating beans. 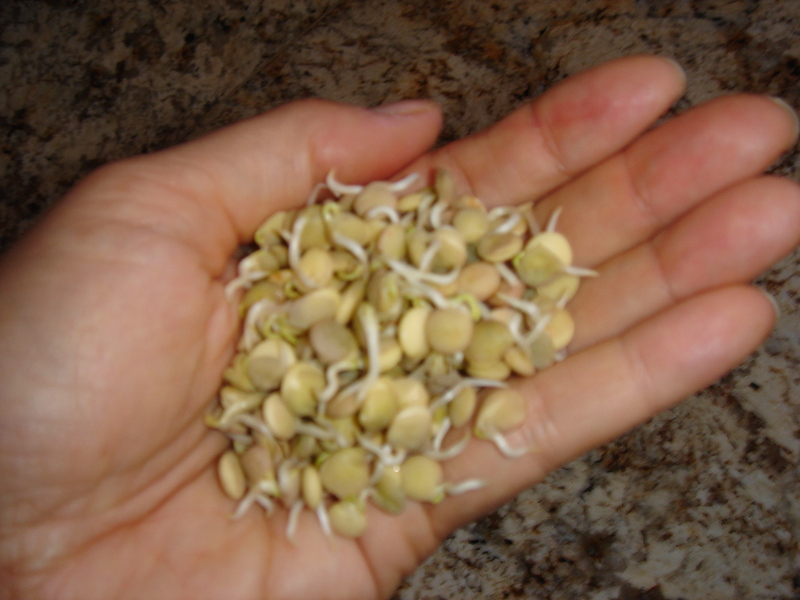 These Sprouts are much easier for us to digest, especially when incorporated into a blended recipe. Fortunately, many grocers carry broccoli, alfalfa, and other sprout mixes if you need a quick fix. Give them a quick rinse and they’re all good to go, although much more expensive than growing your own (All you really need is a colander or sterile jar). And why deny yourself the joy of communing with Nature while creating your own living food? Yes, our local growers have the Winter squashes; cabbage, kale; root vegetables such as potatoes, carrots, parsnips, turnips and beets all season long. And nuts, beans, brown or wild rice, and whole grains are readily available. But please remember to include some fresh raw leafy GREENS and Sprouts on a daily basis for optimal nutrition. You can find organic legumes and seeds that are suitable for Sprouting at local health food stores such as “The Health Nuts” or order on-line at www.Annwigmore.org, www.Sproutman.com, etc. Boost your immune system with an ample supply of Sprouts every day and you’ll be energized and healthy all through the Winter flu season and beyond!